The grasslands of Africa harbor some of the world's most interesting and varied species of reptiles. The climate in Africa's grasslands ranges from warm and wet summers to cold and dry winters. The landscape consists of rolling hills of grass, interspersed with marshland and swamp, with very few trees or shrubs to be found. The largest crocodile in Africa is the Nile crocodile; a grasslands reptile that can reach 20 feet in length, and weigh over half a ton. While the common diet of this legendary man-eater is fish, the Nile crocodile will attack and eat any creature that he happens upon; from zebra to water bison and even other crocodiles. 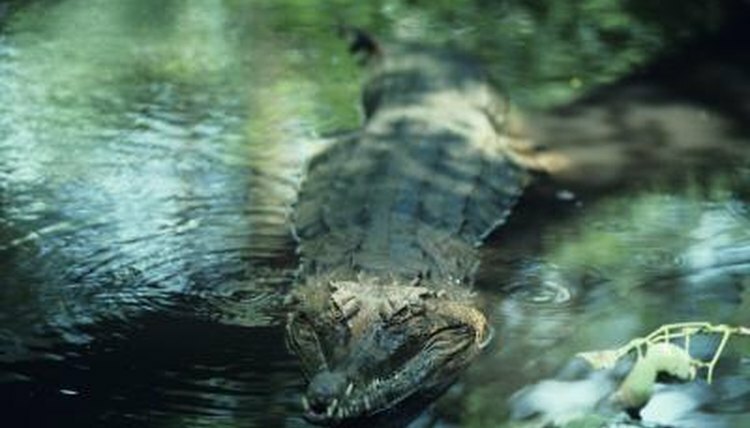 In the 1940s through the 1960s this reptile was hunted close to extinction, however conservation efforts have helped the population hold its ground. Another grasslands reptile that is renowned for its size is the African rock python: the largest snake in the country. This non-venomous snake can grow to nearly 25 feet in length, and kills his prey by constricting them to death. After the python grips his prey--which ranges from large rodents to antelopes and crocodiles--he squeezes tighter every time his prey breathes out. The African rock python inhabits most of sub-Saharan Africa, preferring locations that offer a permanent water source. The leopard tortoise is a peaceful grasslands reptiles that spends most of his days hiding in the long grasses of his habitat. An herbivore, the leopard tortoise grazes on the many different varieties of grass around him, and indulges now and again in the fruit of the prickly pear. Leopard tortoises are on the larger scale of land turtle; they can grow up to two feet in length, and weigh close to 100 pounds. Because of the arid grassland climate, leopard tortoises do not hibernate. Known for being the deadliest snake in the world, the black mamba is a vicious grasslands reptile. The black mamba can reach 14 feet in length and is frighteningly fast: this deadly snake can reach speeds of 12 miles per hour. The black mamba is not so called because of the color of her scales, which are a brownish-grey, but for the purple-black color of the inside of her mouth. The black mamba is most active during the day, hunting the grasslands for birds and small mammals.